The meaningful and useful regulation of the population number is a responsible task because it determines the prosperity and adversity, that is to say the survival or the downfall of a tribe, a people and, in the end, the whole of a humanity. Whether a group of human beings within its restricted living space is intelligent and farsighted enough to keep the balance between the natural death rates and the births, or whether it neglects its relevant direct responsibility for the most diverse reasons and remains inactive, determines whether it can lead a healthy life or exposes itself to downfall. This is valid in small things just as much as in the big things, because the causal law of cause and effect is valid for everything and everybody, in the microcosm and in the macrocosm, for a family just as for a tribe of people and the whole of humanity. Presumably it is easier for the inhabitants of a small island than it is for other human beings to become conscious of the limitations of their habitat and its resources, because when they stand on the ground of their small world and turn around their own axis, they can experience directly for themselves the surrounding confines of their island world. Daily, the nature itself makes them aware that they must live in harmony with it, appreciate it, care for it and protect it, because they are dependent on it and cannot survive without it. The ostrich method, ‘out of sight, out of mind’ and the repressive attitude, ‘What is not allowed to be cannot be’, practised by the majority of the Earth’s humankind in regard to the population catastrophe, is almost impossible on a small island. If a group of human beings or a tribe can develop uninfluenced by outer interferences, free of religious coercive ideas and in tune with the surrounding Creation and nature, obviously then a natural need to keep the population number on a healthy level springs from it. As soon as the sensitive balance between human beings and nature is disturbed and is thrown out of kilter due to unnatural coercion, like cult religions, irrationality, greed, materialism and so forth, the danger exists of an unrestrained overpopulation, which sounds the bell for the self destruction of the culture. The following ‘life stories’ of two islands demonstrate to us the possibilities, as negative and positive scenarios. Easter Island is not only interesting from an ufological perspective (see FIGU contact reports). In his article ‘Easter Island’ (Source: ‹Das Greifbuch›, DTV-Klett Cotta, 1987, ISBN 3-423-10743-X bzw. ‹THE COUSTEAU ALMANAC›) the world renowned ocean explorer Jacques-Yves Cousteau (born on 11th June 1910 in Saint-André-de-Cubzac near Bordeaux, died on 25th June 1997 in Paris) writes that the island must have been a paradise once, so luxuriant and promising that the natives had called it ‘Te Pitot e Henua’ (navel of the world). It would have been the birth place of a flourishing high culture. Today nothing can be seen of it anymore, because in the course of time the population grew explosively. Experts estimate that 20,000 human beings lived on this small island at one time. Thus they used up their sparse life resources, chopped down more and more trees and used every square kilometre of ground for cultivation, in order to feed the growing population. When their religious fervour increased to the point of being all-consuming they deforested the whole island mindlessly. They needed timber for carts, for the giant statues and for their writing tablets, into which they carved their hieroglyphs. In the seventeenth century no more trees could be found on Easter Island. At last the overpopulation had robbed Easter Island of almost all of its food supplies. The few remaining areas under cultivation and the fishing grounds were most sharply guarded by families feuding with each other. Intruders were killed and eaten. 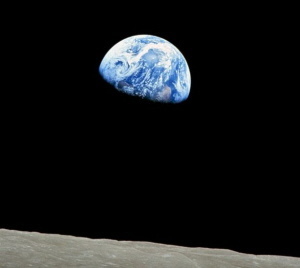 A microcosm of our planet? Further on, Cousteau writes that the human remains on Easter Island had reminded him of the fact that Earth is a living body, a joined system of forces – exactly interbalanced and constantly changing –, as are the ocean and the coast, the trees and the desert. Obviously the human beings on Easter Island – as well as elsewhere – had encroached on a natural process and had discovered too late, that the damage to nature which they had caused, could not be redressed or healed anymore. The results of unknowledge are as fatal as the results of irresponsible behaviour. In Cousteau’s opinion all of us must learn from the sad parable of Easter Island. We must view our Earth as an island and understand that its resources are just as limited as they were on Easter Island. He warned that the same fate that had befallen Easter Island could also befall the ‘island of Earth’, if our nuclear power stations were to melt, our poisonous effluents were to contaminate our waters and if the plethora of rockets and bombs, hoarded by human beings, were fired. Further, he expressed his hope that we should instead pass on the wealth of human ingenuity, our practical experience and wisdom, to living successors. Tikopia is part of the Santa-Cruz-Islands and politically belongs to the province of Temotu of the Solomon Islands. The island is the remnant of an extinct volcano. Its highest point, Mt. Reani, reaches a height of 380 metres above sea level. The area of land amounts to about 5 square kilometres. In the centre of the island, in the old crater of a volcano, there is a large lake, Lake Te Roto, roughly 80 metres deep. A drought in the years of 1952 and 1953 took a toll of 17 deaths on the island of Tikopia. Tikopia is inhabited by about 1200 human beings, who live in more than 25 villages, mainly along the coast. In earlier times the number of inhabitants was constantly around 1000, because the small island with its traditional Polynesian methods of economy, could not feed a larger number of human beings. In order to not surpass this population number, strict birth control was practised. Only the eldest son of each family was allowed to have children. If an unwanted child was nonetheless born, then it was inevitably doomed to die. The limited resources of the island were made available and used by means of well-tried Polynesian agricultural methods. These were determined by the population number. The Polynesians knew from century-long practical experience how to manage on small islands with the limited basics of life. For example, once (around the year 1600), when the number of bred pigs became too big, the islanders decided to kill the pigs and again to turn more to fishing for the procurement of animal protein, because the pigs consumed too many agricultural products and thus prevented the human beings from having a balanced diet. The culture of the Tikopians was highly developed and possessed a complex social structure, as is to be found in many Polynesian societies. Religious concepts and taboos were strictly followed. Due to the general framework in place (care of the resources, birth control) the population of their small island was able to successfully manage and create for themselves – as early visitors described it – ‘a small paradise’.